Yesterday The Daily Caller reported on one of the tools used to fight the recent fire at Notre Dame Cathedral. The damage to Notre Dame Cathedral in Paris could have been a lot worse. If it weren’t for a robot named “Colossus,” firefighters could have lost their lives battling the blaze. Jean-Claude Gallet, the commander of the Paris Fire Brigade, decided not to risk firefighters’ lives and instead retreat. But there was a backup plan to call in help from a 1,100-pound tank-like robot to help battle the blaze Monday and possibly save any of the Cathedral and relics that might remain. The robot named “Colossus,” created by Shark Robotics, stands a bit more than 5 ft. tall and about 2.5 feet wide. The tank was able to venture into parts of the cathedral where the temperatures would likely have killed a human. Gallet told The Times that the robot was able to lower the temperatures in the fire and save lives. Colossus, which is also capable of firing 660 gallons of water-per-minute and controlled via a joystick, took aim at the blaze engulfing the cathedral. It can be operated from as far away as 1,000 feet and the machine is not only waterproof and fireproof but can even withstand thermal radiation, according to the company. What a fantastic use of modern technology. The Daily Caller posted an article today noting that although Valerie Jarrett’s book, “Finding My Voice: My Journey to the West Wing and the Path Forward,” appears as number fourteen on The New York Times’ Best Sellers List, it is number 1,030 on Amazon’s list of top sellers and number 1,244 on Barnes and Noble. Have Valerie Jarrett and her cronies ever been involved in anything where they didn’t try to ‘game the system.? Michael Cohen has been caught lying to Congress. That shouldn’t really be a surprise to anyone, but it happened. The Daily Caller posted the details today. A lawyer for Michael Cohen says that the former Trump fixer directed his former attorney to inquire about a presidential pardon, a claim which, if true, would contradict Cohen’s congressional testimony on Feb. 27. Lanny Davis told The Wall Street Journal Wednesday night that Cohen instructed Stephen Ryan, his previous lawyer, to raise the prospect of a pardon shortly after the FBI raided Cohen’s home in April 2018. “During that time period, [Cohen] directed his attorney to explore possibilities of a pardon at one point with Trump lawyer Rudy Giuliani as well as other lawyers advising President Trump,” Davis told The Journal. That statement directly contradicts what Cohen told the House Oversight and Reform Committee in public testimony on Feb. 27. Michael Cohen is not stupid. I am sure that when he saw the “Mueller Train” coming at him full speed, he was open to trying anything to get out of its way. I believe he would say anything to Congress to limit his jail time and any jail time for his wife. It is unfortunate that some on the Mueller team have resorted to the kind of theatrics and bullying that has been a major part of this investigation. We need to take action in the future to see that all Constitutional rights of Americans are protected–even when a Special Counsel is involved. High school proms are a major event. I think they have gotten a little out of hand since my day, but even then they were a major event. Today they may include hotel rooms, limousines, and hotel ballrooms. We had the high school gym and my future husband’s ’53 Ford convertible. That was it. I do think that high school proms have gotten out of hand, but to me that is an issue the parents need to have to courage to deal with. Yesterday The Daily Caller posted an article about a new policy at Lakeland Regional High School regarding the senior prom. Students and parents at a New Jersey high school plan to protest a new policy banning limos and party buses as acceptable transportation to and from the senior prom, CBS New York reported this week. “We have students from various. . . socioeconomic backgrounds, “ Superintendent Hugh Beattie told ABC 7’s Eyewitness News this week. “And we wanted to provide an even playing field for all students,” he added. The superintendent said the group decision by the administrative team was “based on the concern over the safety of all our students and in providing equity for all students so that they all could enjoy a shared ‘prom experience’ despite socio-economic status,” according New Jersey 101.5. Students will reportedly pay $15 for a 45-minute, chaperoned bus ride from the Wanaque, New Jersey school to Rockleigh Country Club. Parents and students have objected to upending the traditional pomp and circumstance of renting limos for transportation to the prom. “A prom is a school-sponsored function, a school district has the authority to make rules concerning the event,” New Jersey School Boards Association spokeswoman Janey Bramford told New Jersey 101.5. The school does have control of the event, but do they have control of how the students arrive and depart from that event? It is unfortunate that they are using that control to seriously curtail the fun for the seniors. I can’t imaging climbing into a chaperoned bus in a prom gown and being excited about it. I would also think that renting limos or party buses might avoid some of the consequences of teenage drinking and driving (which unfortunately does happen during prom season). This ruling is a perfect example of how socialism works–since not everyone can afford this, you can’t have it. What about the kids who worked all year to save money for the limousine? Aren’t they entitled to the fruit of their labor? High school seniors are old enough to understand that not everyone has the same amount of money. Seeing kids in limousines at the prom might encourage them to work hard to become successful. I think this decision by the school board is ridiculous. If parents don’t want their kids to have limousines at the prom, they need to band together with other parents to discourage the practice. I think the school board is overextending their authority when they attempt to control how the students get to and from the dance. Again, would you want to climb on a school bus in your prom gown? Yesterday The Daily Caller posted an article about a recent high school girls’ track meet in Connecticut. Along with the transgender movement is the idiotic idea that there is no difference between boys and girls. As unfortunate as what is happening in high school sports because of the transgender movement, the results of the various athletic contests illustrate the fact that boys are different than girls. Any woman who has gone on a diet with her husband could have told you that–she eats salads and green things and loses two pounds–he has steak and beer and loses ten pounds. We are made differently. It has to do with muscle mass and hormones. Selina Soule is right–it is unfair to force female runners to compete against male runners. Hopefully the women who have had to put up with competing against men claiming to be women will learn from this experience. Men and women are different and need to be reminded to rejoice in their differences. I understand that there are some people who are confused about their gender, but what is happening now is the result of making something that is the exception rather than the rule fashionable. Hopefully the young people who are caught up in this current transgender fad will come to their senses before they do something irreversible. Channel 25 in Boston reported yesterday that Rosiane Santos, 41, of Falmouth, Massachusetts, was arrested last Friday at a Mexican restaurant in Falmouth for assaulting a man because he was wearing a “Make America Great Again” Hat. The man involved, 23-year-old Bryton Turner of Mashpee, was smart enough to record the incident on his cell phone when she began verbally attacking him. The verbal attacks were followed by knocking the hat of off his head multiple times. As Falmouth police officers were escorting Santos out of the restaurant, Macarao (bartender Geo Macarao) said she took another swipe at Turner. “I couldn’t imagine somebody just coming up and hitting them when there’s cops right here,” Macarao said. “She just tried to grab my hat in front of four officers, not smart,” Turner said. Santos, a Brazilian immigrant, said while she regrets her actions, she claims she was provoked. So let’s look at the logic here for a minute. It was okay for her to assault someone because she had a little too much to drink, she had been bullied in her life, and she had to stand up for herself. How was assaulting a man who simply entered a restaurant to pick up his food standing up for herself? I think it is time to take a serious look at the attacks on Trump supporters and give the attackers the severest penalties possible. These attacks are not the earmark of a civilized society. President Trump is not responsible for these attacks–the attackers are responsible for these attacks. In November 2016, The Daily Caller posted a list of substantiated attacks on Trump supporters at that time. There have been many more since them. Again, President Trump is not responsible for these attacks–the attackers are. That is something we all need to remember. Walter Jones was my Congressman. I met him on various occasions. He was a humble man who worked hard to represent the people of eastern North Carolina. I know of more than one instance when he went out of his way to help someone cut through the red tape of government to get help with an issue. Tonight The Daily Caller posted an article about his death. Jones, who represented his North Carolina district for over 20 years, was fighting off several illnesses over the last few months, according to Fox News, and was granted a leave of absence in late 2018 after missing several votes on the floor. A strong supporter of the U.S. Marines, Jones previously served in the North Carolina General Assembly. His district has numerous military bases, and while he initially supported the war in Iraq, he eventually sided with Democrats calling for the withdrawal of troops from the country. Any time a constituent spoke with Walter Jones, he told them how concerned he was about the budget deficit. He would not vote yes on any bill that increased the deficit. He was a man who represented the people in his district well and stuck to his principles. The Daily Caller posted an article yesterday about the Virginia Democrat who sponsored a bill that would allow the termination of a pregnancy up to 40 weeks old. Just for the record, 40 weeks is a baby ready to be born. Democratic Virginia Delegate Kathy Tran has also introduced another bill– “House Bill No. 2495 – Fall cankerworm; spraying prohibited during certain months.” That bill is to protect the lives of fall cankerworms, gypsy moths, etc. It is disturbing to me that Ms. Tran is more concerned about the survival of an insect that damages trees than she is about babies. Yesterday The Daily Caller posted an article that explains a few things that were curious at the time. When viewing these events, it’s a good idea to consider the underlying currents–establishment Republicans don’t want the wall any more than the Democrats. Their reasons are different, but the goal is the same. That is why the Secure Fence Act of 2006 was never actually carried out. 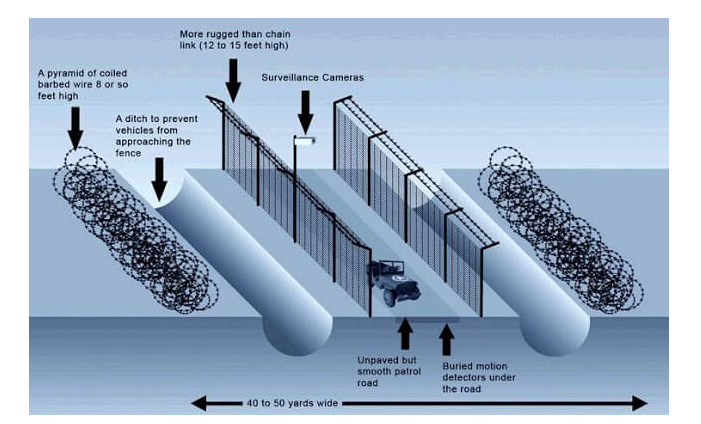 100 percent fed up detailed the timeline of events following the passage of the Secure Fence Act of 2006 in an article posted on August 16, 2015. 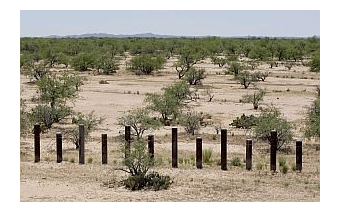 In his speech in El Paso on immigration reform on May 10, 2011, Obama declared that the fence along the border with Mexico is “now basically complete.” Like much of what comes out of the Obama administration, that was a lie. What was supposed to be built was a double-layered fence with barbed wire on top, and room for a security vehicle to patrol between the layers. Except for 36 of the seven-hundred-mile fence, what was built looks like the picture above or the one below. Somehow the two pictures do not appear to be the same. Hutchison’s amendment was included in a federal budget bill in late 2007 despite the fact that Rep. Peter King, R-N.Y., had a cow…he argued the amendment effectively killed the border fence promised in the 2006 bill, he was right. Hutchison’s intentions may have been honorable, but she didn’t foresee Barack Obama being the next president. Here’s the bottom line. Back in 2006, the people of the U.S. were promised a border fence. Since then thanks to Kay Bailey Hutchison and Barack Obama 95% of the fence wasn’t built. The arguments against the fence are bogus especially if you look at Israel’s history. It’s time for America to demand that its leaders build the fence they promised. No one can honestly say it wont work, after all, it hasn’t been tried. Paul Ryan began well. He stood up to President Obama on various issues (without actually accomplishing anything). He began as a budget hawk, trying to keep spending under control. However, he somehow became part of the Republican establishment and went down the wrong path. I seriously doubt that he ever had any intention of building the wall. Yesterday The Daily Caller posted an anonymous article written by someone they know to be a senior official in the Trump administration. I am posting the full text of the article because I believe all of it is very important. I have no additional comments. Fake news has accused President Trump of lying when he said there was a ten-foot wall around former President Obama’s House. Well, The Daily Caller’s Benny Johnson decided to do his own fact checking. 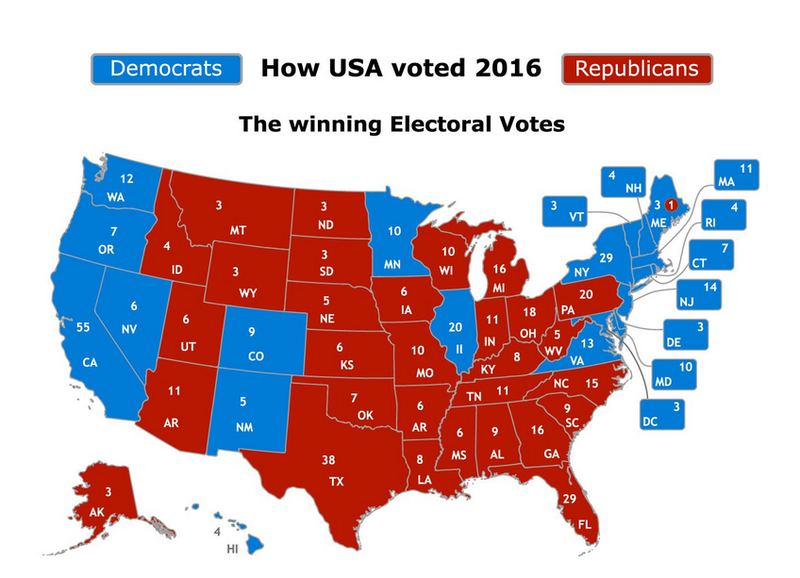 The result is below. I agree with the final point of the video. We protect the things we value–our families, our homes, etc. Why in the world are the Democrats (and many Republicans) so reluctant to protect our country? The Daily Caller reported today that the Democrats refused to negotiate with President Trump on the wall and then blamed President Trump for the government shutdown that is the result of unsuccessful negotiations. Democratic leaders walked away from the negotiating table Thursday in the midst of a government shutdown over funding for border security, a senior White House official tells The Daily Caller. The government partially shut down shortly before Christmas after President Donald Trump refused to sign an appropriations bill that did not contain his requested $5 billion for border wall funding. Since then, Republicans and Democrats — who will take control of the House in the New Year – have been looking to strike a deal to reopen the government. …The new development all but confirms that the government will remain shut down through the New Year — until Democrats take over the House and current House Minority Leader Nancy Pelosi gets confirmed as Speaker. House Republicans confirmed on Thursday that there are no votes scheduled for the remainder of the week. Pelosi promised that when she assumes the speakership, she will put forth appropriations legislation that does not include any of the president’s demands. Pelosi and Senate Minority Leader Chuck Schumer have repeatedly sworn not they would not budge on funding for Trump’s border wall. There are actually very few people in Washington who want a border wall. However, there are many people throughout America who want the wall. So what is the disconnect about? It’s about money and votes. The Democrat Party sees illegal immigrants as people who will eventually become citizens and Democratic voters. The Republican Party sees illegal immigrants as a cheap source of labor for their corporate sponsors. One of the major lobbying groups and campaign contributors is the U.S. Chamber of Commerce–a group that loves cheap labor. Unfortunately neither political party is willing to address the danger to Americans caused by an open border.